Just wanted to mention again, that I will be attending the Artist Alley at Anime Central this weekend, at Table G05. 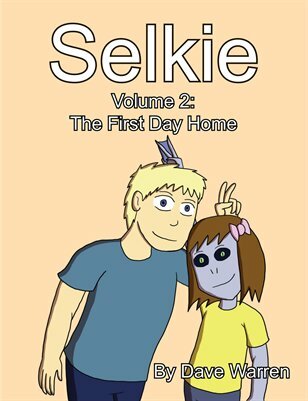 I’ve also compiled a second Selkie book to bring along, which features the second half of the Adoption Day introduction story (with all it’s shoe shopping glory). Book 2 is also available on Magcloud Here. It occurred to me halfway through this that this makes the second time Grandma and Grandpa have been written as being unavailable for joining the function du jour (first time being when they had a previously arranged party to attend and couldn't babysit Selkie during the coffee incident). I probably don't strictly NEED to specifically state what activity they are undergoing that prevents them from joining the current arc, I just hate the idea of them being absent without explanation. Plus, hey, meet Steve. Bonus. Hate to be the party pooper, but since my nieces and nephews went into what I term “the foster care nightmare” basically because their grandma was driving them around while intoxicated, I can’t see the “always available” thing as realistic. Yikes. Sorry to hear about all that. No, no; she’s a much more formidable strategist than Napoleon. You may think that now, but just wait until she starts a land war in Russia. I think the rule is ‘Never get involved in a land war in Asia’. You’re forgetting Vietnam and Afghanistan, one of which was a serious problem for the United States and the other of which was the same for Russia. Besides, you can’t go wrong with that one. Or with ‘Never go against a Sicilian when death is on the line’ either…. I perhaps borrowed from that phrase unconsciously, but I was referring to Napoleon Bonaparte’s ill-advised and unsuccessful invasion of Russia, the strategical blunder that ultimately led to the end of his French Empire and his exile. During Napoleon’s time, the phrase ‘land war’ wouldn’t have been used because there was no alternative – Selkie, on the other hand, will presumably have access to air support and long range missiles. Therefore, I thought ‘land war’ necessary to emphasize the comparison. Since it was Russia’s “General Winter” who defeated both Napoleon and Hitler, and since Selkie is not fond of the cold, I would expect her to have better sense than to get started in that direction in the first place. Oh, FINALLY. Todd’s told Selkie the morals about bragging about your freinds and family, and using them as status symbols. It may have been short but it’s a start. 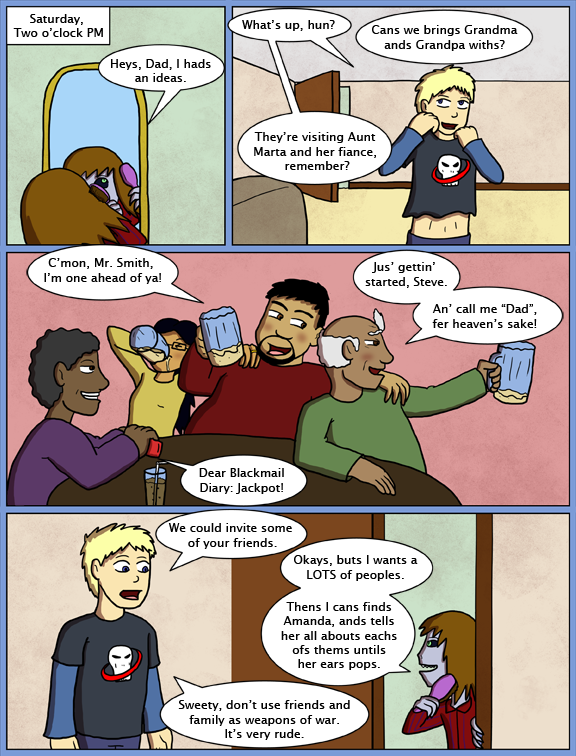 I love Selkie’s grandparents and would like a panel of explanation of whenever they are not present for a page. Even if Selkie is at school. Especially if Selkie is at school. Ooooo… Now they are going to have an audience. This will be terrible, but good that Todd and Selkie have immediate support when things blow up with Andi. It’s like a very slow train accident. Will there be an army of Steves? My hair is telling me “maybe”. Dragonball Abridged? Do they just leave out all the “we have to hurry” lines? So this is the build-up to Todd and Selkie meeting with Andi and Amanda? Tsk. Andi narrowly avoided having to discuss it with Todd while the kids were present, but she didn’t follow up on that by arranging to discuss it while they weren’t. Doesn’t she see that the same situation is likely to happen at the aquarium, and it’s going to be harder to keep evading? When is Steve going to be told that his niece-to-be is nonhuman?